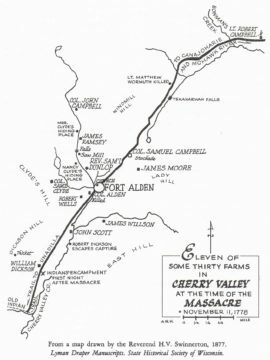 The Cherry Valley massacre was an attack by British and Iroquois forces on a fort and the village of Cherry Valley in eastern New York. It has been described as one of the most horrific frontier massacres of the war. A mixed force of Loyalists, British soldiers, Seneca and Mohawks descended on Cherry Valley, whose defenders, despite warnings, were unprepared for the attack. During the raid, the Seneca in particular targeted non-combatants, and reports state that 30 such individuals were slain, in addition to a number of armed defenders. The raiders were under the overall command of Walter Butler, who exercised little authority over the Indians on the expedition. The Seneca were angered by accusations that they had committed atrocities at the Battle of Wyoming, and the colonists' recent destruction of their forward bases of operation at Unadilla, Onaquaga, and Tioga. Butler's authority with the Indians was undermined by his poor treatment of Joseph Brant, the leader of the Mohawks. Butler repeatedly maintained, against accusations that he permitted the atrocities to take place, that he was powerless to restrain the Seneca. During the campaigns of 1778, Brant achieved an undeserved reputation for brutality. He was not present at Wyoming and he actively sought to minimize the atrocities that took place at Cherry Valley. Diaries belonging to British soldiers during the campaign state the regiment as being the butchers and given that Butler was the overall commander of the expedition, there is controversy with whom actually ordered or failed to restrain the killings. 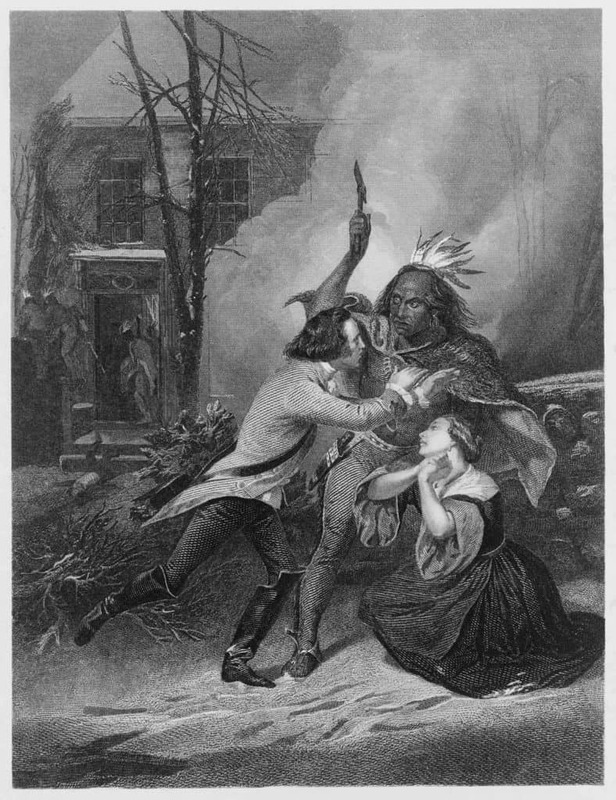 The massacre contributed to calls for reprisals, leading to the 1779 Sullivan Expedition which drove the Iroquois out of western New York. Armies - American Forces was commanded by Col. Ichabod Alden and consisted of between 250 Soldiers. British Forces was commanded by Walter Butler & Chief Joseph Brant and consisted of between 700 Indians and Soldiers. Casualties - American casualties were estimated to be 44 killed and 41 captured. British casualties were about 5 wounded. Outcome - The result of the battle was a British victory. The battle was part of the Northern Theater 1778-82. With the failure of Lieutenant General John Burgoyne's campaign to the Hudson Valley after the Battles of Saratoga (First and Second) in October 1777, upstate New York became a frontier war. The Mohawk Valley was especially targeted for its fertile soil and large supply of crops farmers were supplying Patriot troops. British leaders in the Province of Quebec supported Loyalist and Native American partisan fighters with supplies and armaments. During the winter of 1777–78, Joseph Brant and other British-allied Indians developed plans to attack frontier settlements in New York and Pennsylvania. In February 1778, Brant established a base of operations at Onaquaga (present-day Windsor, New York). He recruited a mix of Iroquois and Loyalists estimated to number between 200-300 by the time he began his campaign in May. One of his objectives was to acquire provisions for his forces and those of John Butler, who was planning operations in the Susquehanna River valley. Brant began his campaign in late May with a raid on Cobleskill, and raided other frontier communities throughout the summer. The local militia and Continental Army units defending the area were ineffective against the raiders, who typically escaped from the scene of a raid before defenders arrived in force. After Brant and some of Butler's Rangers attacked German Flatts in September, the Americans organized a punitive expedition that destroyed the villages of Unadilla and Onaquaga in early October. While Brant was active in the Mohawk valley, Butler descended with a large mixed force and raided the Wyoming Valley of northern Pennsylvania in early July. This action complicated affairs, for the Senecas in Butler's force were accused of massacring noncombatants, and a number of Patriot militia violated their parole not long afterward, participating in a reprisal expedition against Tioga. The lurid propaganda associated with the accusations against the Seneca in particular angered them, as did the destruction of Unadilla, Onaquaga, and Tioga. The Wyoming Valley attack, even though Brant was not present, fueled among his opponents the view of him as a particularly brutal opponent. 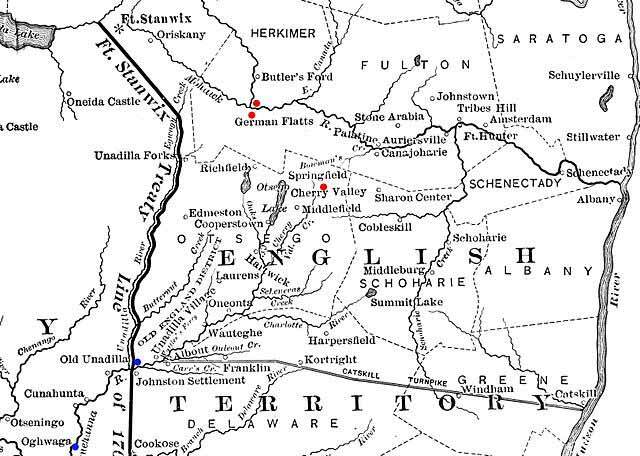 Brant then joined forces with Captain Walter Butler (the son of John Butler), leading two companies of Butler's Rangers commanded by Captains John McDonell and William Caldwell for an attack on the major Schoharie Creek settlement of Cherry Valley. Butler's forces also included 300 Senecas, probably led by either Cornplanter or Sayenqueraghta, and 50 British Army soldiers from the 8th Regiment of Foot. As the force moved toward Cherry Valley, Butler and Brant quarreled over Brant's recruitment of Loyalists. Butler was unhappy at Brant's successes in this sphere, and threatened to withhold provisions from Brant's Loyalist volunteers. Ninety of them ended up leaving the expedition, and Brant himself was on the verge of doing so when his Indian supporters convinced him to stay. The dispute did not sit well with the Indian forces, and may have undermined Butler's tenuous authority over them. Cherry Valley had a palisaded fort (constructed after Brant's raid on Cobleskill) that surrounded the village meeting house. It was garrisoned by 300 soldiers of the 7th Massachusetts Regiment of the Continental Army, commanded by Colonel Ichabod Alden. Alden and his command staff were alerted by November 8 through Oneida spies that the Butler–Brant force was moving against Cherry Valley. However, he failed to take precautions, continuing to occupy a headquarters some 400 yards from the fort. 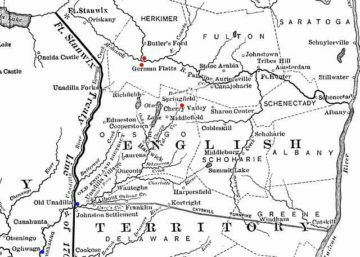 On November 10, late in the day, Butler's force arrived near Cherry Valley and established a cold camp to avoid detection. Reconnaissance of the town identified the weaknesses of Alden's arrangements, and the raiders decided to send one force against Alden's headquarters and another against the fort. Butler extracted promises from the Indians in the party that they would not harm noncombatants in a council held that night. On November 11, the attack began early in the morning. Some overeager Indians spoiled the surprise by firing on settlers cutting wood nearby. One of them escaped, raising the alarm. Little Beard led some of the Senecas to surround the Wells house, while the main body surrounded the fort. The attackers killed at least sixteen officers and troops of the quarters guards, including Alden, who was cut down while he was running from the Wells house to the fort. Most accounts say Alden was within reach of the gates, only to stop and try to shoot his pursuer, who may have been Joseph Brant. His wet pistol repeatedly misfired and he was killed by a thrown tomahawk hitting him in the forehead. Lieutenant Colonel William Stacy, second in command, also quartered at the Wells house, was taken prisoner. Those attacking the Wells house eventually gained entry, leading to hand-to-hand combat inside. After killing most of the soldiers stationed there, the Senecas slaughtered the entire Wells household, twelve in all. The raiders' attack on the fort was unsuccessful. Lacking heavy weapons, they were unable to make any significant impressions on its stockade walls. The fort was then guarded by the Loyalists while the Indians rampaged through the rest of the settlement. Not a single house was left standing, and the Senecas, seeking revenge, were reported to have slaughtered anyone they encountered. Butler and Brant attempted to restrain their actions but were unsuccessful. Brant in particular was dismayed to learn that a number of families who were well known to him and whom he had counted as friends had borne the brunt of the Seneca rampage. Cherry Valley lies south of the Mohawk River and east of the northern end of Lake Otsego. Unadilla is southwest, near where the Unadilla River joins the Susquehanna. Onaquaga lies a short way further southwest, on the Susquehanna. Lt. William McKendry, a quartermaster in Colonel Alden's regiment, described the attack in his journal: "Immediately came on 442 Indians from the Five Nations, 200 Tories under the command of one Col. Butler and Capt. Brant; attacked headquarters; killed Col. Alden; took Col. Stacy prisoner; attacked Fort Alden; after three hours retreated without success of taking the fort. Most of the slain soldiers had been at the Wells house." Accounts surrounding the capture of Lieutenant Colonel Stacy report that he was about to be killed, but Brant intervened. "[Brant] saved the life of Lieut. Col Stacy, who [...] was made prisoner when Col. Alden was killed. It is said Stacy was a freemason, and as such made an appeal to Brant, and was spared." On November 11, Butler sent Brant and some rangers back into the village to complete its destruction. The raiders took 70 captives, many of them women and children. About 40 of these Butler managed to have released, but the rest were distributed among their captors' villages until they were exchanged. Stacy was taken to Fort Niagara as a prisoner of the British. A Mohawk chief, in justifying the action at Cherry Valley, wrote to an American officer that "you Burned our Houses, which makes us and our Brothers, the Seneca Indians angrey, so that we destroyed, men, women and Children at Chervalle." The Seneca "declared they would no more be falsely accused, or fight the Enemy twice". Butler reported that "notwithstanding my utmost Precaution and Endeavours to save the Women and Children, I could not prevent some of them falling unhappy Victims to the Fury of the Savages," but also that he spent most of his time guarding the fort during the raid. Quebec's Governor Frederick Haldimand was so upset at Butler's inability to control his forces that he refused to see him, writing "such indiscriminate vengeance taken even upon the treacherous and cruel enemy they are engaged against is useless and disreputable to themselves, as it is contrary to the dispositions and maxims of the King whose cause they are fighting." Butler continued to insist in later writings that he was not at fault for the events of the day. The violent frontier war of 1778 brought calls for the Continental Army to take action. 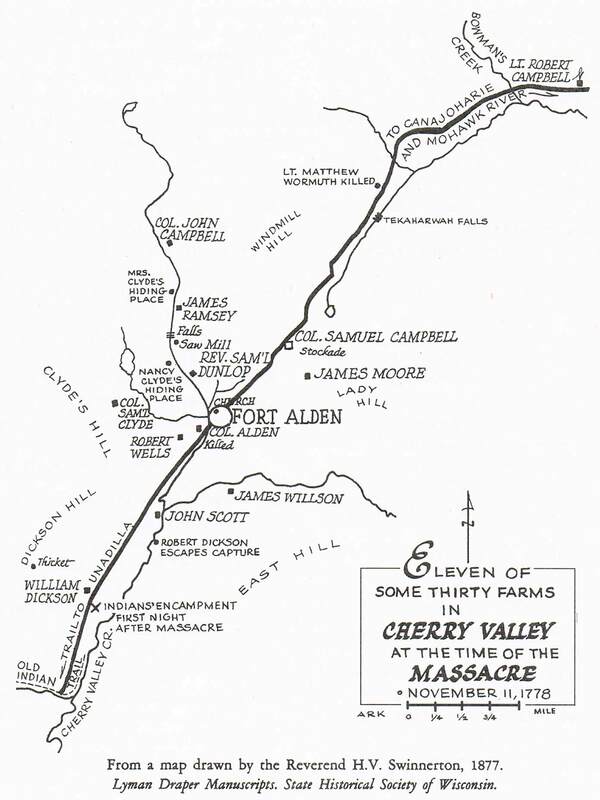 Cherry Valley, along with the accusations of murder of non-combatants at Wyoming, helped pave the way for the launch of the 1779 Sullivan Expedition, commissioned by commander-in-chief General George Washington and led by Major General John Sullivan. The expedition destroyed over 40 Iroquois villages in their homelands of central and western New York and drove the women and children into refugee camps at Fort Niagara. It failed, however, to stop the frontier war, which continued with renewed severity in 1780.